Are you looking for healthy tuna recipes, easy to make and tasty? If yes, take a look at the Best No Mayo Tuna Patty Recipe. Only 15 minutes to make! Just fifteen minutes and supper is served. As an added bonus, it’s also a healthy meal! There are certain recipes that are just perfect for week-nights. You know, the ones that come together in less time than it takes for you to stand in line at the take out counter. Let me show you that with just fifteen minutes, you can make this delicious and healthy tuna patty recipe. The first thing we are going to do is open up a couple of cans of tuna. Canned tuna is truly a pantry staple. It is convenient, great-tasting and definitely budget-friendly. Canned tuna is also a great source of high quality lean protein, omega-3 fatty acids and of course niacin. Remember to always purchase canned tuna from companies that are committed to long-term seafood sustainability. If you are interested, a fellow Canadian blogger over at Diversivore wrote a fantastic article on sustainable seafood. So, once you have drained the liquid from the cans (I prefer the water packed variety) simply combine the tuna with the rest of the ingredients, all except the eggs. You may have noticed that there is no mayo in this recipe. 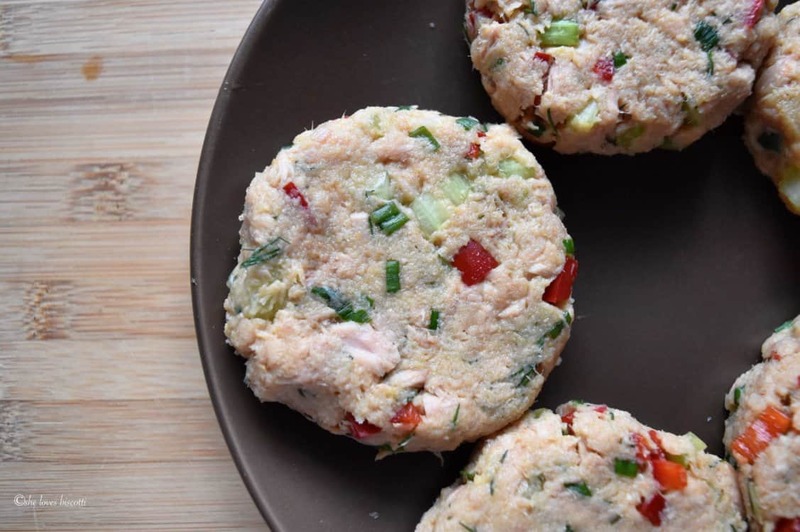 It really is not required when making these tuna patties. WARNING: nutrition rambling ahead on why to make this tuna fish recipe. Don’t get me wrong, I love mayo, but in moderation. A quick glance at the nutritional information found on a regular mayonnaise jar will indicate that 1 tablespoon will provide 90 calories and about 10 grams of total fat; some of which are beneficial fatty acids. The challenge when using mayonnaise is sticking to the 1 tablespoon. As a dietitian, I truly believe that it is so important to increase awareness when it comes to healthy and well-balanced eating habits; and at the end of the day, just being mindful of what you are eating and where your food comes from, is a step in that direction. Food for thought: canned fish is a healthy protein alternative, why would we want to drown it in mayo? Instead, we will rely on the eggs to bind the mixture together. The addition of some wonderful herbs and vegetables will get the job done as far as taste is concerned. Be sure to properly combine the mixture and by that I mean really “squishing” the mixture together. How is that for a fancy culinary word? Seriously though, press each patty together in order to achieve a final product which is compact. This will prevent your healthy tuna patty from falling apart as you are cooking it. The only thing left to do is to saute the best tuna patty ever! 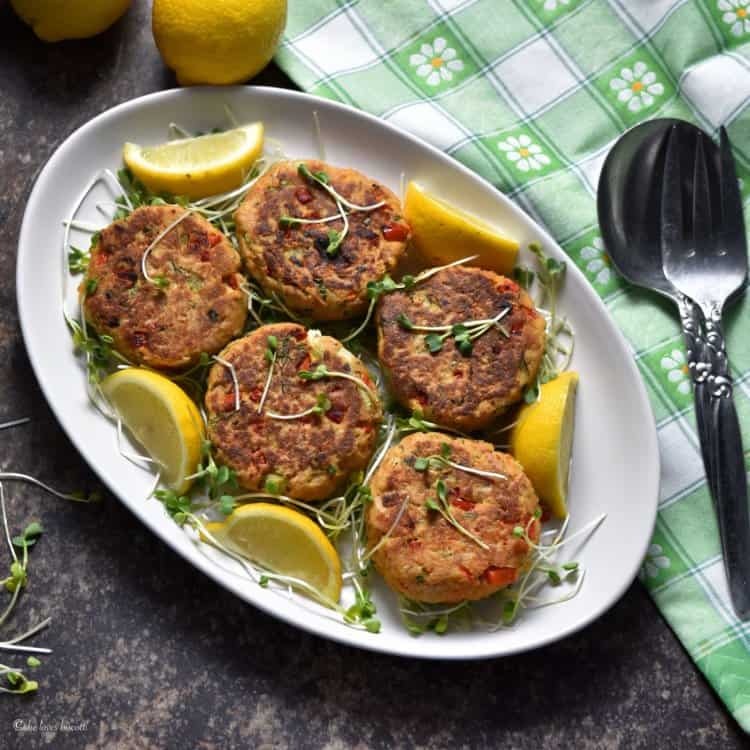 If you are looking for another quick, easy and healthy fish meal, may I suggest this recipe for Simple Oven Baked Garlic Oregano Crusted Cod Fish, or this Italian Tuna Pita Melts. Both of these recipes are ready in just 30 minutes (just click on the link for the recipe). Remember to always purchase canned tuna that is from a sustainable source so that we can all continue to enjoy this wonderful pantry staple. I am a big fan of simplicity -especially when it comes to recipes. Uncomplicated and wholesome ingredients coupled with straightforward procedures -most probably a result of my Italian upbringing. My friends and family know this and I love how they always share their recipes with me. This is truly a privilege. I would like to extend my gratitude to my cousin Mary for sharing this healthy tuna patty recipe with me. Over time, it has become one of my go-to recipes for quick weeknight meals, especially on Monday nights. Feel free to replace some of your favorite ingredients in this recipe. For example, I love Italian flat-leaf parsley, but this herb can easily be replaced with cilantro; the same for the chives, feel free to replace with green onions or even shallots. I love a tuna patty that has a little crunch to it, so I added some red pepper along with some celery stalks. And if you like heat, go for it! With a generous squirt of lemon juice, get ready to taste the Best No Mayo Tuna Patty Recipe! 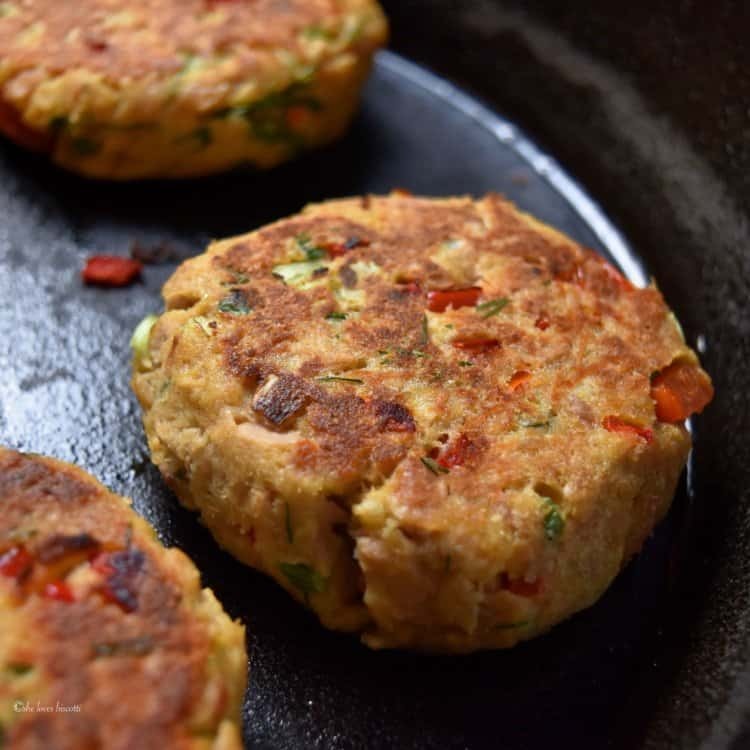 ★★★★★ If you have made this tuna burger recipe using canned tuna, I would love to hear about it in the comments below and be sure to rate the recipe! Are you looking for healthy tuna recipes that are easy to make and tasty? If so, come and take a look at the Best No Mayo Tuna Patty Recipe. 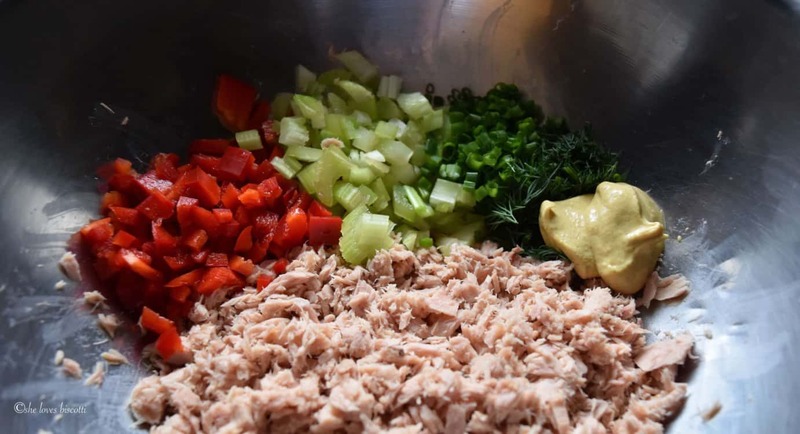 Not only is this canned tuna recipe healthy, it's ready in less than 15 minutes! In a large mixing bowl, combine the tuna with all of the ingredients except the raw eggs. Add the beaten eggs and mix well together. Form into 5 equal patties. In a cast iron or a non-stick pan, add the oil and saute the patties over medium heat. Cook until golden brown, about 3-4 minutes per side. 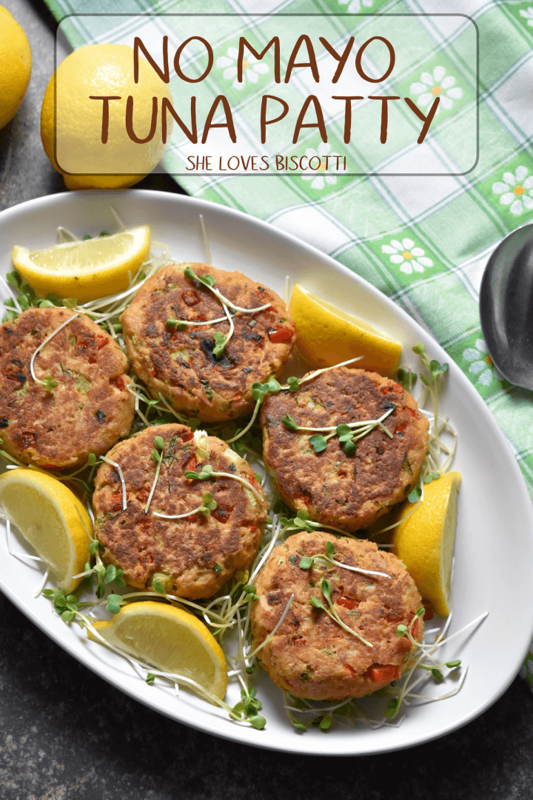 DO YOU LOVE THIS TUNA PATTY RECIPE? PIN IT TO YOUR FISH AND SEAFOOOD BOARD! I didn’t have bread crumbs so I used ritz crackers! I am thrilled to hear this! What a great variation Suzanne… I must try it the next time I make these tuna patties. Thanks so much for taking the time to share, appreciate it! Made these tonight – Yummo! They will be part of our regular dinner rotation. Thanks for sharing!! I like! Fast and delicious! I always have tuna on hand to supplement my hectic schedule generally for salads, spreads or sandwiches. You recipe elevates the humble can of tuna to something rather special. These tuna patties are absolutely dinner guest material. Another healthy and creative recipe Maria, grazie. Great recipe, they look super crispy and yummy. My recipe involves a lot of faff with dipping in eggs and breadcrumbs but after seeing your I think you have converted me. so thank you for that! If I can offer a tip in return, make a nice regular salad, lettuce, tomato etc and squeeze half a lime over it, cut up a mango and stir into the salad. Serve the fishcakes on top of the salad, it’s awesome!